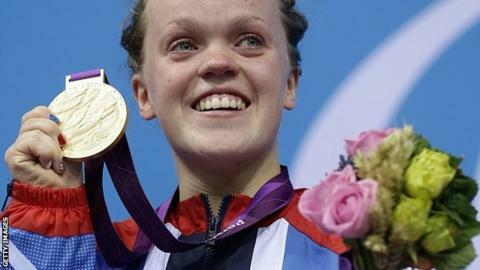 Britain's Ellie Simmonds set a new world record to retain her Paralympic S6 400m freestyle title in London. The 17-year-old triumphed in five minutes 19.17 seconds to beat the record by more than five seconds. The previous record had been held by 17-year-old American Victoria Arlen, who was overhauled by Simmonds in the final 100m to finish second in 5:20.18. "I just wanted to go out there and retain my title and win a gold medal," a delighted Simmonds told BBC Sport. "My coach said I was capable of a 5:19 race but I wasn't thinking about that. I was quite nervous leading into it because Victoria has been in such good form leading into the Games." Arlen broke Simmonds's world records in the 100m and 400m freestyle at the US trials in June, but earlier this week she was told she was ineligible to compete at the Paralympics. She successfully appealed and, after Saturday's 400m heats, the International Paralympic Committee said Arlen could keep her S6 classification until August 2013, although she will be assessed in the breaststroke event this week. Simmonds, who set a new Paralympic and European record of 5:24.64 in the heats, trailed Arlen up to the 350m mark. However, she edged ahead in the final 50m, cheered on by the majority of a 17,000-strong crowd at the Aquatics Centre. "When I came out and there was a massive roar it gave me a massive buzz. In the last 50m I gave it my all and when I touched the wall I had nothing left," Simmonds added. "There was a lot of pressure on me and I could feel the expectation, but I've had an amazing four years of training and I have trusted my coach Billy Pye all the way." Simmonds also paid tribute to Arlen, who spent two years in a vegetative state after contracting a virus and had to learn to swim again. "She is an amazing athlete and I knew I had to be on top form to beat her," she said. "I knew she would push me to the best of my abilities and she did. It wouldn't have been an exceptional race or an exceptional time if she wasn't there. "I am looking forward to racing her in the future, but I am going to enjoy this moment." Claire Cashmore added another silver to the GB tally in the SB8 breaststroke. The Briton qualified fastest but in the final finished behind Russian Olga Vladykina, who set a new world record. Matt Whorwood took bronze in the S6 400m freestyle in a race won by Ireland's Darragh McDonald. There was disappointment for GB stalwart Sascha Kindred, who was seeking a fourth consecutive SB7 breaststroke title but could finish only fourth as Australian Blake Cochrane won gold.